The last few months I’ve spend an absurd amount of time scanning family negatives. Over 12,000! For this I used the excellent Nikon CoolScan LS-50, also known as the Nikon CoolScan V ED. 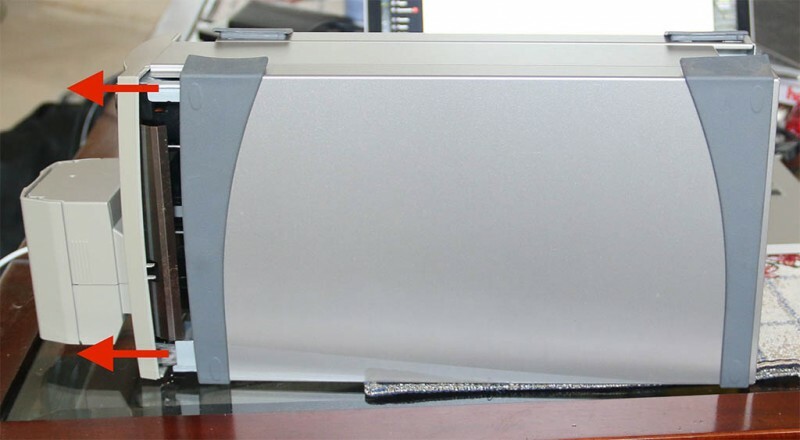 These scanners perform superb, even though Nikon stopped producing them. Even support has been stopped or reduced. If you need one, eBay is the place to go. In the process of scanning all these negatives, I ran into the problem that it had swallowed the film strip, and the entire scanner refused operation right after that. 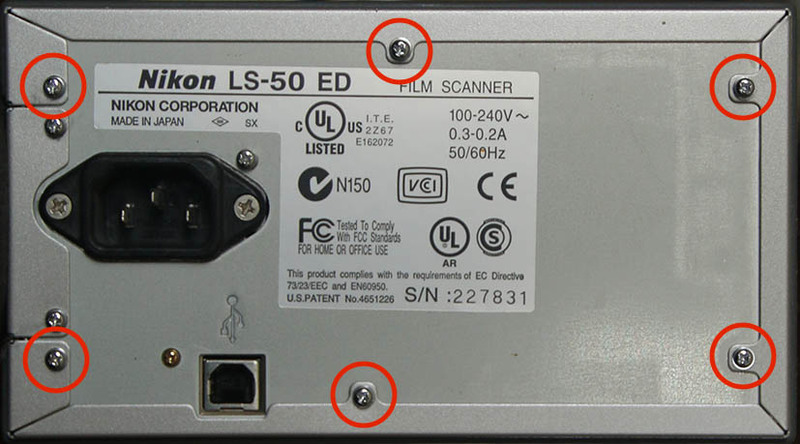 Please note that this article was written with the LS-50/V ED in mind, but it seems that other Nikon CoolScan models might be fixable in the same fashion (i.e. 4000 [IV] and 5000, and other models that look similar). What makes your Film Strip get stuck in a Nikon CoolScan? This problem occurs with other similar Nikon CoolScan models as well, that can handle the SA-21 film strip adapter. Typically, the SA-21 film strip adapter of the Nikon CoolScan, looses “grip” on your film, and then you’re stuck. Well, the film is stuck inside the scanner. You’ll see the green light blinking, indicating an error, and the adapter can no longer be removed. The latter I’d call a serious design flaw, but oh well … the performance of these scanners more than compensate for this little inconvenience. Turning the scanner OFF and then ON again, fails as well. This is where the SA-21 usually ejects film strips that were still in the scanner when you turned it off. Like I said: that fails as well. Film strips should at least be 2 full frames long, preferably even more. Some film strips have something taped at the end, do NOT insert those, remove the tape first. Some films strips have damaged peg holes, do these manually, do not rely on auto feed. Some strips have paper strips “glued” to the sides, after removing these make sure to remove residual glue. Some film strips are too much bend/curved, I recommend scanning those manually. Adapters for manually scanning different film formats … ? Naturally, I had other film laying around like 110 and 126, which are not supported. I did however find a company called FilmScanUSA (product link) that offers adapters which insert into a MA-20 or MA-21. These are much cheaper than used Nikon adapters (for example the FH-2 and FH-3) and support plenty other film sizes. At the time of this writing, they offer: 110, 126, 35mm, APS, Minox, and even 8mm film. I’ve used a few of their adapters and they are of good quality and work as expected. I highly recommend it! Before we proceed, make sure you have a proper fitting Phillips Screwdriver, and some patience. Make sure to shutdown your Nikon CoolScan, unplug the power cord, and unplug the USB cable. At the rear of the scanner, you’ll notice 12 screws, you only need to remove the 6 circled ones in the image below. Do not remove the other screws. At the bottom, you’ll find 4 rubber feet under which we will find a total of 4 screws that we need to remove. 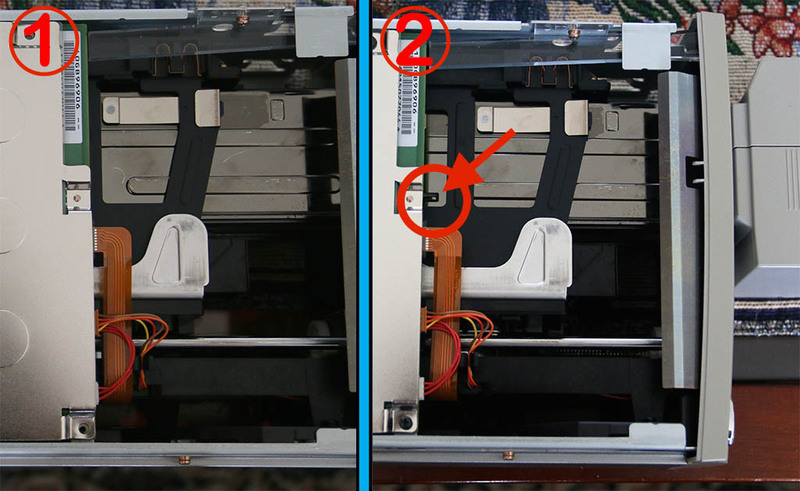 The rubber feet or covers cannot be completely removed as they are attached to the side/top rubber strips of the scanner. Thank goodness they are not glued, but it takes a little effort to open them by pulling one corner loose. Once opened, remove the screw you found under the feet. Step 4: Slide the hood off. To remove the hood/casing, I’ve found this to work the best by first placing the Nikon CoolScan upside down on a flat surface. With all 4 screws at the bottom and 6 in the back removed, you can now slide the scanner mechanism out of it’s hood/case. In this next step we will try to unlock the film strip adapter, in my example a Nikon CoolScan SA-21. This adapter is mechanically locked, and that’s why we can’t remove it the usual way. I’d say this is a minor design flaw, in an otherwise well done device, as a small emergency eject button would have prevented the need for opening up the scanner all together. 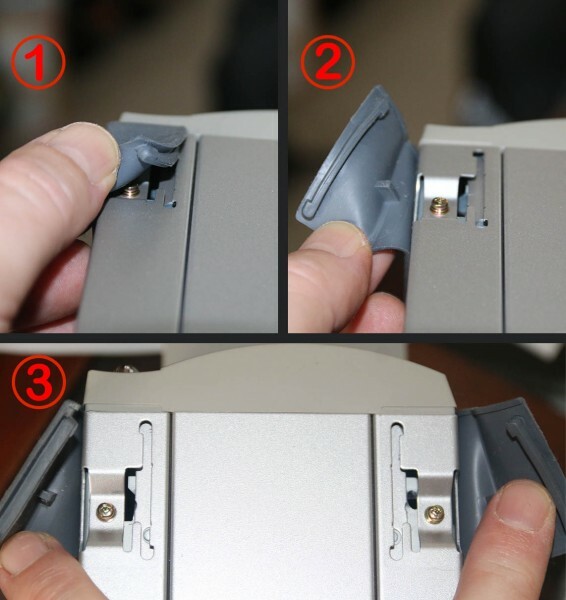 The locking mechanism is a simple small pin, which needs to be pressed for it to release the adapter. 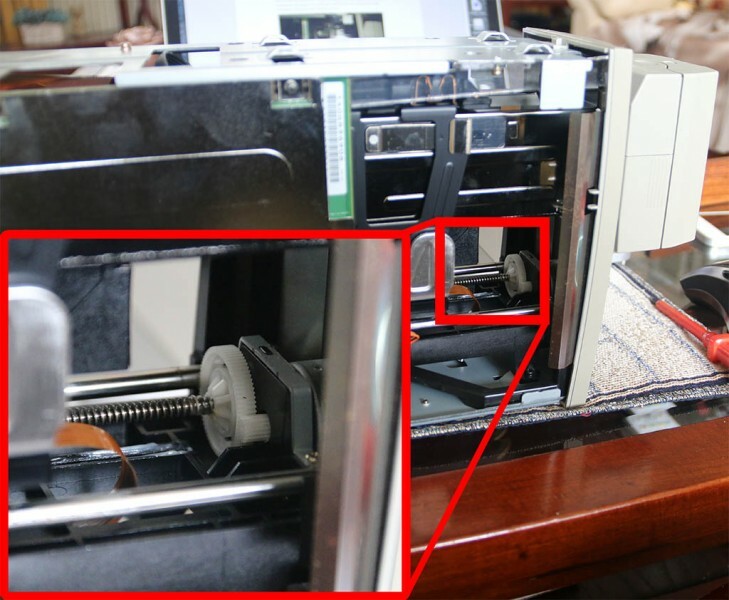 However, in most circumstances you cannot even see this pin as the mechanism is usually in it’s “back” position, which causes it to be covered by the control board of the scanner (hidden behind the large metal cover in the pictures). Now we could of course remove the controller board, but thank goodness that’s not required. By turning the little white cog wheel in front we can move it to it’s “forward” position so we can access the locking pin. This cog wheel (white in figure 4), can be found in the front of the scanner, near the bottom. Turn it gently with your finger until you see the locking pin (part 2 in figure 5). Now that we can reach for the locking pin, time to remove the film strip adapter. 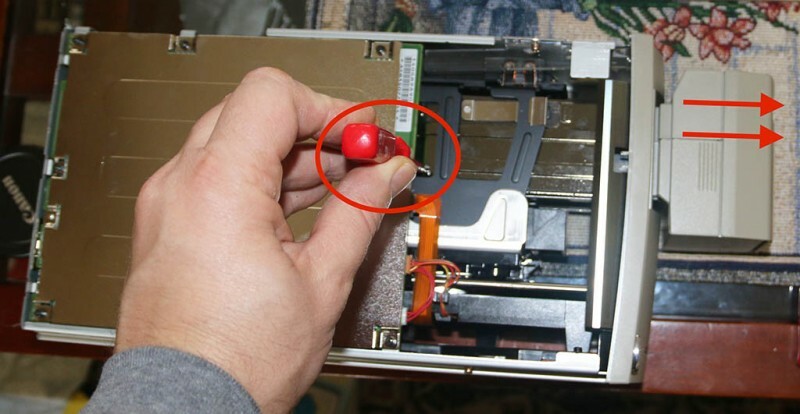 This is done by gently pressing the pin (see part 2, figure 5) down, for example with a screwdriver. Keep it pressed down while gently removing the film strip adapter from the scanner. After we have removed the film strip adapter, check if there is any debris left in the scanner. In all the times I have taken my scanner apart, I did not find anything, but it’s better to be safe than sorry, right? Next we can put the hood back on the scanner, and here again I’ve found it easiest to work with the scanner being upside down. Make sure the front is snug to the hood before doing anything else. I’ve found that on occasion the hood won’t slide on all that great. Next, we place the 4 screws back under the rubber feet, and reattach the rubber feet. I’ve found it easiest to insert on of the rubber pins first and then rubbing the rubber with your thumb, back and forth a few times, until everything feels like it’s back in place again. After all rubbers are back in place, screw the 6 screws back into the back. In this last step, we are going to remove the film strip that got stuck in the adapter, which is quite easy with the SA-21. First we press the little “button” so the front part can open. After that we lift the top, which comes off the adapter entirely. Next we open the metal film guide, by pulling back the shiny metal clamp and lifting the metal film frame. Once opened you can remove the film strip and/or debris you might find there. After cleaning things up, reassemble the SA-21 and you’re good to go for scanning more film strips. To avoid this from happening again, read the suggestions at the beginning of this article. There are 70 comments. You can read them below. Excellent guide! Just what I needed. I didn’t have the stones to open the scanner, but your guide gave me confidence to do it anyway! Nice article. At least I now know, how to take it apart, should I need it. Especially the hidden ‘bonus’ screws. Anyway, I’m using VueScan, too. And hadn’t bothered with Nikon Scan at all until I fooled around and tried a ‘what, if?’ to see, what happens, when you put a single frame negative strip into the scanner. Guess what, it stuck. To make a long story short: Your step 8 is actually described in the manual and Nikon Scan will do the unlocking for you. When you get a stuck film, turn off the scanner, close VueScan and start Nikon Scan (NS). Turn the scanner on and it will try to eject the film, noting an error. If that isn’t recognized by NS, wait a moment and gently pull on the SA-21. The lock gives enough room to disconnect it. Push it in again and wait for NS to recognize the error that it cannot eject the film. Press “OK” on the dialog and you should hear a distinctive ‘clack’ noise, which is the lock unlocking. You now can safely remove the SA-21 and go to Step 8 (or follow the manual). Oh, and many thanks for the hint where to find a 110 Pocketfilm adapter, I’ve been googling the prints of my fingertips for 3 weeks now trying to find something to help me. I did try the gentle pull of the SA-21, the short disconnect and reconnect trick did work as described, didn’t resolve the issue though. But I guess I’d need Nikon Scan for that – which is said not to run under Yosemite … Did you manage to get it to work under one of the recent MacOS X versions? I tried, but have not been lucky so far. Thanks again fro the nice comment! I’ve been looking for something like this – I have boxes of old 35mm films that I need to digitise and there aren’t many affordable scanners that do it well, just stumbled upon it while chatting with you about Plex / Pi! Might be a bit of a problem with shipping cost to NZ though, but at least have some investigation to do now! Haha that’s funny to see that we both appear to be running into the same issues. 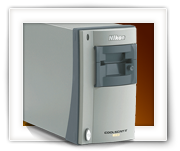 I have used the Nikon CoolScan LS-50 for more than 13,000 photo’s and together with VueScan I have to admit that I’m really impressed with the quality and ease of use. I can truly highly recommend this scanner (and their bigger brothers/sisters) for the job. If you look on eBay, you’ll find some affordable ones – even though the price can seem rather high for a used item, they most certainly are worth it. Nikon did an excellent job with these scanners, and even today they still out-perform most modern scanners. Note that I have 3 of these scanners now – one of them I had shipped to the Netherlands while I was staying there. Shipping didn’t seem to be a big deal. Might want to look for one with the original box though (for best protection when it’s being shipped). The film adapter is stuck and won’t come out. There is no film in it. 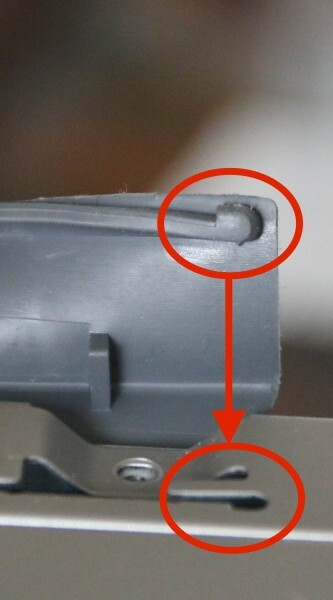 I opened the Nikon LS-50 ED according to your beautiful instructions, but no release pin was found as in part 2 fig 5. Can you help, I don’t want to give up. I’m glad to see that you found my website, and I’m sorry to hear you could not find the latch. If you look at step 5, then you’ll see that I’m turning the white cog you see in the front of the scanner. By turning it, the black “carrier” moves so that you can eventually see the latch. Do you see that latch or hole when you turn the white cog? Do you have a picture of what it looks like right now? Thank you for your answer. Yes I now found the pin and I pushed it down with a screw driver. Now the pin went in, it won’t come out and the carrier is still stuck in the scanner. I can see the pin but it is impossible to grab it. I bought this scanner in 2008. Is it time to give up on it? I would not give up yet. I have 3 of these scanners and I absolutely love them, even though the “film getting stuck” might happen. Did you try gently wiggling the carrier? Possible making sure that the pin stays down? The pin is [usually] the only thing holding the carrier back. Can you see if there is film somehow holding it back? OK, I will try again in the morning in daylight. It is 3:30 AM here. I do not see any film. I don’t think there film in there. Like I said: don’t give up. The first time mine got stuck I felt quite desperate myself. But it’s fixable … don’t worry. We just need to find why yours does not come out. Soon I’ll be at it. I have been at it now for a while. The pin is deep inside, I pushed on that pin with a dental instrument, but it will not move. I can’t take a picture because it is to small and dark. The pin is stuck inside it’s opening and will not move at all. The carrier won’t move in any direction. There is no film stuck in it. Do you think that a drop of lubricating oil, DW40 or sewing machine oil, on that stuck release pin might help? Oh no, I would never use anything like that in my scanner! I’d be to nervous where that all might go. Can you gently wiggle the pin with tweezers or something like that? I’m actually surprised how stuck the carrier is. I know it doesn’t fall out automatically, but you should be able to slide it out. I’d actually be happy that the pin stays down haha. I have tried everything. Nothing gives. Maybe it is time to take more screws out to see what is going on. I’m always nervous when taking devices like this apart – before you know it some weird spring pops out that we cannot put back haha. I wish I could see what things look like, but like you said: it’s small and dark. Hard to take pictures of. The carrier doesn’t even have a tiny bit of wiggle room? You would not give up yet? Yes the carrier does have a mm of wiggle up and down. The pin is a little horizontal barre deep in the hole and does move in a little when I push on it with the dental instrument. I’ll try again to take a picture again, maybe with the help of a strong flashlight. I don’t see the pictures I just sent. Let me know if you can see them. They are pretty OK. I reduced the size of the 4 pictures. Do you see them? I have not seen any of the pictures. Did you click reply in your email program, to reply to the notification email? That should arrive only in my mailbox, it would not appear here – but I have not received anything yet. Otherwise try emailing it to webmaster at tweaking4all dot com. See if you can get it now. It looks pretty good, can the pin go any deeper (don’t use too much force)? With mine I’d actually have to hold the pin down when sliding the carrier out (to get started). Maybe it’s not in far enough and still holds the carrier back enough to prevent it from ejecting? The pin is stuck, it will not go in any deeper. I had help: one of us pushed hard on the pin which is not giving at all, the other person tried to pull on the carrier. Time to take more screws out? What do I have to lose at this point. I suppose that’s the only option left – but I’d be careful with removing screws. Any article I have found so far strongly recommends NOT doing that. Maybe it’s better to look for a cleaning/repair service online. Last time I checked they were not all that expensive, and they [should] have more experience with situations like this and your scanner (mirror) will be nice and clean again. I think it’s worth it. Thank you for your patience with me and my scanner. There are repairs shops around here. That would be the safest option of course. I’ll keep you informed of any new development. Let me know if and how they fixed the scanner? I took the scanner to my local photo shop, Colonial Photo. The tech was able to unstuck that pin on site and remove the carrier at no charge. When I got home, following your instructions and was able to remove the one frame negative that was stuck in the carrier. Now I know that in the future if I have a one frame neg I will put it in an old slide frame to scan it. The scanner works perfectly. Thank you for all your help and good advice. Thanks for getting back, and great to hear you’re up and running again. Don’t feel bad though; I too have made the “one negative” mistake. Do you recall how he managed to the the pin unstuck? The attendant took the scanner in the back room to the repair department. When he came back I asked how the repairman got the pin unstuck, but he wouldn’t tell me, he said it was magic. Well, at least I’m glad your scanner is up and running again! Thank you. My scanner jammed on an unmounted slide film and I went to the internet and googled “jammed Nikon Coolscan”. Your instructions saved the day. Thank you again. That’s great to hear! Thanks for taking the time to leave a comment. It’s so motivating to see messages like this. Glad your scanner is up and running again! Awesome! Makes my day to read a comment like that! What should I have done without this instruction??? Bring it to Nikon? Thanks so much for putting this online! With your instruction and the pics the job was done in a few minutes!! Thanks again, you really helped me out! Awesome! Glad the article helped you out … bringing it to Nikon is what I considered as well, but as far as I could find they no longer support these scanners … so I has to figure it out for myself as well. Thank you very much for posting a “thank-you”, it so makes it worth writing more of these kind of articles. Thanks a lot for this great tutorial. That’s what i needed. Awesome! Glad to hear that Joerg! the problem i have is that the scanner does not recognise the MA-21 adaptor in place.. I believe the slide has been removed without ejecting the slide as it does not lock in place even with slide in. do you think this is the slide or machine fault ? is there a workaround ? hope you can help thanks for your time. unfortunately, I’m traveling for work at the moment, so I don’t have my scanner handy to take a look. I have not ran into this issue, but it might be worth looking in the MA21. Off the top of my head, there might be a tiny latch inside that might need popping (the one that detects slides being inserted). You could of course try to insert a slide before inserting the MA21 into the scanner. I wish I had my scanner nearby so I could see what might be causing this. Since the film adapter works, I’d assume the issue is in the MA-21 adapter. Followed your steps to fix it and they worked perfectly. I have had excellent experience with the Nikon Coolscan V ED (LS-50) and was very concerned, when the film strip jammed. You provided a real service. it’s much appreciated and I’m happy to hear that the article was helpful! You’re my hero of all times!!!! Thank you for this excellent tweak … you just saved my most loved Nikon-scanner! Thank you Danny for taking the time to post a Thank-You! It’s always fun to hear people enjoying the articles I write, very much puts a smile on my face! Awesome to hear your Nikon is running again! Thank you so much ! You made my day ! Thanks for sharing. You’re most welcome, and thank you for posting a thank you – it always makes my day when I see I was able to help! I found this thread and successfully extracted the SA-21 from the scanner. (Thanks!) I found a tiny (pinhead size) piece of ripped off film that fell out when I removed the SA-21 However, the problem still isn’t fixed. When I start up the scanner, the light blinks quickly after a few seconds, and then it won’t do anything more. I can’t make out anything else in the mechanism that could be causing a jam. On the other hand, everything works fine with the slide adapter, so it would seem that the scanner itself is okay, but the SA-21, or the interface with it, is the problem. I tried blasting the SA-21 with compressed air to get any other pieces out, but nothing changes. It simply will not work. I guess the next step is to try taking it apart? (a bit daunting). Anyway, have you heard of anybody having a situation like this, and what the solution could be? First of all, thank you for the thank you post! As for hte SA-21 not working properly; I cannot say that I have ran into this exact same issue, however, I have had it that an adapter was acting weird. Cleaning the contacts at the end of the SA-21 might help, cleaning the entire unit might help, but it could also be that one or the other sensor is either dirty or failing. I did find a very good article here on how to disassemble the SA-21 and locate (and even replace) the sensors. – The adapter does not readily grab the film when you insert it. – The scanner reports that it cannot detect the film after it was inserted. – The scanner seems to work scanned frames are not properly centered within their image files. Thanks for your reply. I’m going to have to work up some courage to take it apart and clean it. I don’t know that I’m up to the soldering necessary to replace to the sensors, and I’m not really on eBay at this point. But hopefully just some cleaning will do it. I’ll post back once I’ve tried it. Yeah I can imagine that the soldering is not something to look forward to. I’ll keep my fingers crossed! Just a silly question; Do you, or anyone you know happen to have a IS-20(S) laying around (for APS films) – my IA-20 just died. And they are soooo hard to find. The ones on eBay are most of the time the IA-20 model (which is the model can not handle films with 40 exposures, the IA-20(S) however can). Anyhoo — if anyone has a IS-20(S) for sale … please let me know! p.s. This guy also offers servicing Nikon scanners, it’s the same guy that made the description on the sensors. In case you’re in a pickle, consider contacting him. Thank you! Great video and thank you for referring to this article! Thanks a bunch! My Nikon 5000 is once again operational and the neg has been saved. I owe you a beer! Awesome – glad to hear that this helped. I know it hurts to not be able to use such a nice scanner! Thanks for taking the time and effort to write a thank-you note, it’s much appreciated. Thanks a lot for the very detailed tutorial ! Although some nervousness, i followed the steps one-by-one and now I’m back on track ! Great job you did ! Thanks again ! Awesome! Glad to hear this getting back on track again! Thanks for posting a thank-you – it’s very much appreciated. Hey there, this is a very informative article. I have a question that doesn’t pertain to this model or issue, but is related and I am very desperate to find an answer so if you could shed light on it at all that would be very awesome. I just got a Braun FS120 medium format film scanner and when I took the tray out, the negative had come loose and fell off inside of the scanner. This is super frustrating considering I just got it yesterday and didn’t even finish scanning my first roll! Do you have any pro tips on how to get it out? 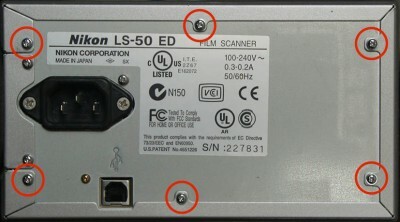 The screws are on the bottom of the scanner instead of the back and don’t appear to be as removable as your Coolscan. Im tempted to just prop open the tray gate and shake it out, like you would a pick stuck in a guitar, but Im worried about what shaking it around would do to the insides. Sorry again for being off topic here, any help you could offer would be very helpful. I’d be happy to help, but I do not have a Braun FS120 – and do not know what it looks like (side, back etc). I’ve tried to find images, but couldn’t find any. I did notice however that it might be the same device as a Reflecta 120, and the Pacific Image Primefilm 120 (PF120) – again couldn’t find any details. One thing I do know about devices like this is that you should be willing to accept that the scanner might die permanently by opening it – which is what happened with my Nikon, since there is hardly any service to be expected from Nikon. I’d be happy to look at pictures if you have any (email me at webmaster at tweaking4all dot com), but please keep in mind that it will be guess work for me as well, and not being able to feel how things move or click make it quite a challenge. If you just bought this scanner, I’d recommend seeing if Braun offers some sorts of support before trying to open it yourself. Oof. That’s a tough sentence to read, “be willing to accept that the scanner might die permanently.” I’m not trying anything now! Hahah, I’m far too high strung to try something if that’s a possibility. I just emailed B&H, who I purchased it from, for some advice. I bought the warranty and have only had it since Friday, so I’m hoping we can figure something out. I haven’t turned it on since it fell off in there, so I’m just going to leave it as is until I hear back from the company. Thank you though for your immediate response, especially on a holiday weekend. It means a lot to me. Have a happy new year and I’ll let you know what B&H Photo says! Yeah I know – taking things apart can be fun, but can come at a price as well … like I said: Nikon is no longer offering support. So my choices were pretty simple at the time: keep it useless and broken, break it, or get lucky and fix it. Either way – a chance to get it fixed would have been better than not being able to use it at all. But with warranty – I’d most certainly go that route first. You’re welcome! And a Happy New Year for you as well! But I have one more problem. This problem has been around for some time. The film negative will not feed properly. left is still a small border from the previous image. How can I correct this? This does not happen with the slides, but only with the film negatives. My Filmstrip Adapter ist FA-21 and my hardware ist Nicon CoolScan 5000. The Software is Vuescan. This sounds like an initial misfeed or a too large scanner “window” (the area it scans). Slides are not the best comparison, since there would not be a second negative. I do not have a simple fix for this. My recommendation would be to test another adapter (I’m not familiar with the FA-21, did you mean SA-21?). I have noticed similar issues with feeders where I have to manually slide in negatives (not 35mm film) – but I assume this is not the case in your setup. but you were very lucky. Here in Germany costs a Nikon Coolscan 5000 with film negative adapter to 7000 euros. You’re right I have the SA-21. it’s worth a look – like I said; I found a seller of a bundle of scanner and adapters. I just contacted the seller and asked if he would be willing to sell just the adapter. It’s worth a try . I do have several SA-21’s, but at the moment I’m not able to see how many, if I have a leftover and if they work properly.